A fresh new year is well under way and with it comes fresh new opportunities to travel, have fun, learn new things, savour good food and great wine, enjoy time with friends and family, and make memories. This newsletter is dedicated to all of these worthy activities! 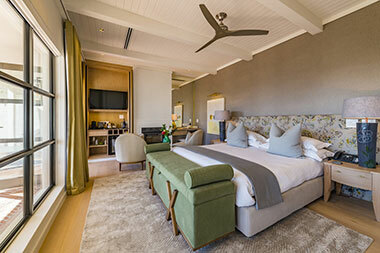 In 2018 La Petite Ferme completely overhauled our five Vineyard Suites - which are nestled on the slopes of the Franschhoek Mountains, with spectacular views over the valley. Extensive renovations have seen these beautifully located suites evolve into contemporary and luxurious accommodation with extensively updated interiors featuring all the creature comforts and modern conveniences. The Florentine Suite was inspired by the lush greenery of our cherished vineyards. Soak up the panoramic views while relaxing by the private plunge pool on the patio, or in winter relax by the fireplace after a day of exploring the Franschoek area. Floretine offers a king sized extra length bed, an en-suite bathroom with heated towel rails and under floor heating (the spectacular view can also be savoured whilst lying in the bathtub), air conditioning and under floor heating in the bedroom, a mini bar, tea and coffee making facilities, an electronic safe, smart TV, and wireless internet connection. You can’t go wrong booking a stay in the Florentine Suite, leave feeling relaxed, refreshed and romanced! La Petite Ferme will be serving lunch and dinner on Valentines Day from our à la carte menu. Diners can look forward to a welcome drink on the lawn gazing out over the majestic views of the Franschhoek valley, followed by a romantic meal from our fresh Summer Menu, carefully prepared by Head Chef Kyle, Sous Chef Maveer and their talented kitchen team. 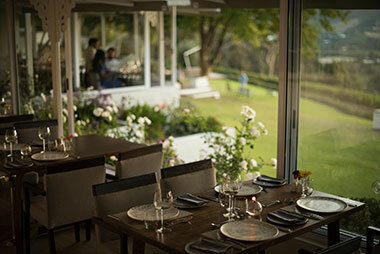 Discerning diners will be blown away with the creatively styled and locally-sourced menu at La Petite Ferme. La Petite Ferme are also offering prizes to the best dressed Valentines themed diners as well as a surprise Valentines Day dessert. Booking are essential. Call 021 876 3016, or send a mail to reception@lapetiteferme.co.za. In each newsletter our chefs will be sharing one of their much-loved La Petite Ferme recipes. This seasons offering is sure to be a firm favourite with pork belly lovers. Pre –heat oven to 180 C.
Place all the ingredients together in an oven pan/deep casserole dish. The pork belly must fit snugly in the pan. If the liquid does not cover the meat add more water until it does, then cover with oven proof tin foil and braise until the meat is fork tender. Let the pork belly cool completely in the cooking liquid. Preferably overnight. Then pour the cooking liquid into a sauce pan - ladle off any visible fat. Reduce the liquid over medium heat by a quarter and then add 50ml of low sodium soy sauce. The resulting broth should be light and flavourful with a little saltiness. 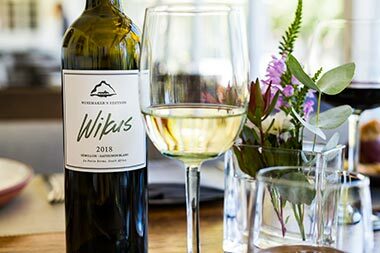 We are pleased to announce the launch of our new Winemakers Edition wine – entitled Wikus – which is named after our wine maker Wikus Pretorius. “Wikus” is a blend of Elim Semillon and Franschhoek Sauvignon Blanc grapes. The Semillon grapes come from the cooler climate of Elim in Cape Agulhas and the Sauvignon Blanc from our Franschhoek Estate. The Semillon and Sauvignon Blanc are vinified separately, with the Sauvignon Blanc, pressed and fermented in 100% stainless steel, whilst the Semillon is pressed and fermented in stainless steel then transferred to old 228L barrels for 6 months of ageing. We are left with loads of tropical fruit aromas with hints of pineapple, passion fruit and black current – a perfect wine for Summer in South Africa, and a perfect accompaniment to the Thai braised pork belly! 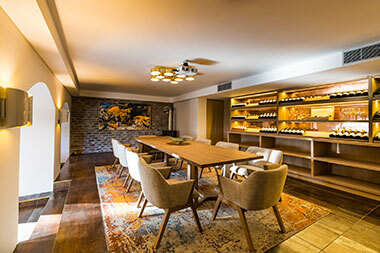 A reminder that our wine tasting lounge has been made available for bespoke small formal dinners, intimate celebrations, executive business meetings and small conferences. It has a modern audio visual system and can be adapted for many different types of events – whether they are full or half-day. La Petite Ferme is not just about luxurious accommodation, delicious food and award winning wines – we also offer activities to our in-house guests and visitors. One of these is an intimate Vine Orientation talk which is led by our Wine Guide through the La Petite Ferme vineyards. Offered daily at 10:30am, 12:00pm, 13:30pm and 15:15pm, guests get to experience a tasting of 6 varietals along with a tasting booklet and selection of canapés to accompany the wines. 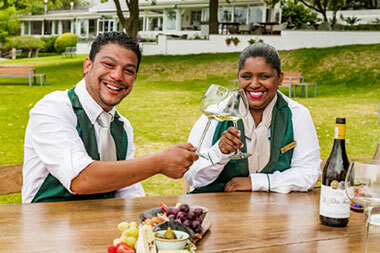 The Vine Orientation is complimentary to in-house guests and costs R200 per person for visitors. Note no under 18 year olds permitted and a maximum of 6 guests per orientation.